It's been a big year so far for Contemporary Christian singer songwriter Lauren Daigle, who took home two Grammy Awards at this year's ceremony! 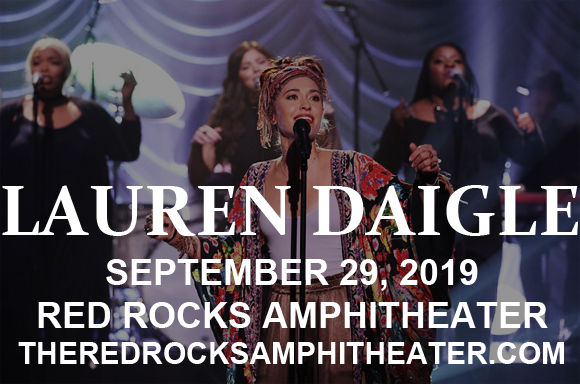 Now, the phenomenally gifted artist comes to Red Rocks Amphitheater on Sunday 29th September 2019 to perform from her recent, award-winning release on the Look Up Child Tour! American contemporary Christian music singer and songwriter Lauren Daigle first came to public attention in 2012 as a contestant on American Idol. Daigle made her debut as a featured singer on North Point InsideOut's 2015 album Hear, with the songs "Close" and "You Alone". She released her debut solo album, How Can It Be, later that year, charting straight in at number one on the Billboard Christian Albums Chart and reaching number 17 on the Digital Albums Chart, as well as number 28 on the Hot 100. The album was certified platinum by the RIAA and produced three number one singles on the Billboard Christian Airplay chart ("First", "Trust in You" and "O'Lord"). Her follow-up album, Look Up, Child (2018), debuted at number three on the Billboard 200 chart, becoming the highest-charting Christian album by a woman in over 20 years, and number one on the Top Christian Albums chart. The album won the Grammy Award for Best Contemporary Christian Music Album at the 2019 awards ceremony, and its lead single, "You Say", won the Grammy Award for Best Contemporary Christian Music Song. To date, Daigle has won seven GMA Dove Awards, two Billboard Music Awards, two American Music Awards, in addition to her two Grammys, and has had four number one singles on both the Billboard Christian Airplay and Hot Christian Songs chart.